Search and adopt a Maltese near you. The Maltese is one of the smallest breed of dog in the toy group, known for its silky white hair. Many owners of pet Maltese opt to give them a short "puppy cut" for ease of grooming. The Maltese breed has descended from dogs originating in the Central Mediterranean Area. Characteristics include a slightly rounded skull, with a one-finger-wide dome and a black nose two finger widths long. The body is compact, the length equaling the height. The ears drop with long hair and they have very dark eyes, surrounded by darker skin pigmentation (or "halo"), gives Maltese their expressive look. Their noses can fade and become pink or light brown in color. This is often referred to as a "winter nose" and many times will become black again with increased exposure to the sun. The coat is long and silky without an undercoat. The color is pure white and although cream or light lemon ears are permissible, they are not as desirable. A pale ivory tinge is permitted and traces of pale orange shades are tolerated but are considered an imperfection. Adult Maltese range from roughly 3 to 7 lb. (1.4 to 3.2 kg), standards, as a whole, call for weights between 4 and 7 lb. (1.8 and 3.2 kg). There are variations depending on which standard being used. Many, like the American Kennel Club, call for a weight that is ideally less than 7 lb. between 4 and 6 lb. preferred. Maltese are cuddly, companion dogs. They thrive on love and affection. 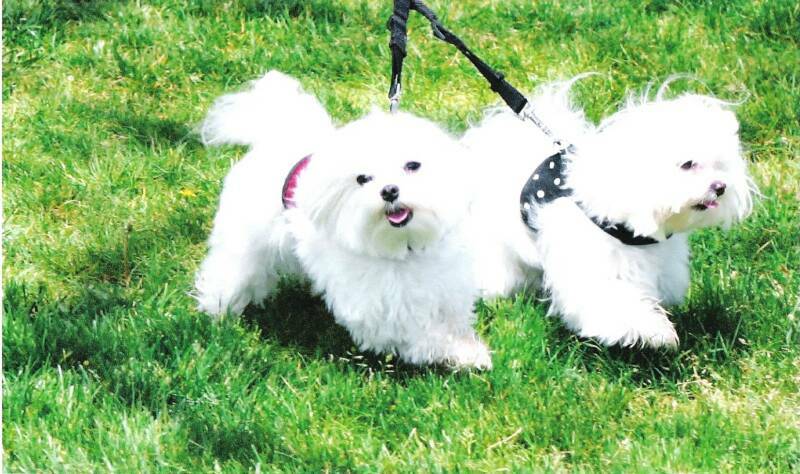 They are extremely playful, and even as a Maltese ages, his or her energy level remains fairly constant. Some Maltese can be snappy with smaller children and should be supervised when playing, although socializing them at a young age will reduce this habit. The Maltese is very active within the house, and, preferring enclosed spaces, does very well with small fenced yards. For this reason the breed also does well with apartments and townhouses, and is a prized pet of the urban dweller. Maltese have no undercoat, and have little shedding if cared for properly. Like their relatives the Poodles and Bichon Frisé, they are considered to be largely hypoallergenic and many people who are allergic to dogs might not be allergic to the Maltese. They make very good friends with other breeds especially the Lhasa apso. Daily cleaning is required to prevent tear staining. Regular grooming is also required to prevent matting. Many owners will keep their Maltese clipped in a "puppy cut," an all over trim that makes the dog resemble a puppy. Some owners, especially those who show Maltese in the sport of conformation, wrap the long fur to keep it from matting and breaking off, and then to show the dog with the hair unwrapped combed out to its full length.